M ohamed Salah’s player of the year award stole the headlines at the Confederation of African Football awards in Ghana but the triumph of the Nigerian forward Asisat Oshoala in collecting the women’s equivalent was similarly special. 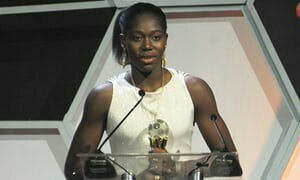 On receiving the accolade for the third time – the others coming in 2014 and 2016 – Oshoala was teary as the road to her latest win has been anything but straightforward. Having won the golden ball and the golden boot at the 2014 Under-20 Women’s World Cup as Nigeria finished runners-up – added to an African Cup of Nations winner’s medal the same year – the young striker started to turn heads internationally. So when she was unveiled as Liverpool’s latest recruit in January 2015, and with the then manager, Matt Beard, labelling her “one of the best young players in the world”, the transfer was headline news across Africa. Yet despite the evident talent, the Super Falcons star struggled to make her mark in England. After a year at Liverpool, blighted in the end by injury, and a switch to Arsenal, her two-year sojourn in Europe came to an end when she chose to join Dalian Quanjian in the Chinese Women’s Super League in February 2017. That is what has made this CAF player of the year award mean so much. With many writing her off she has proved she still has an eye for goal and bags of ability. All the while the Nigerian national team remains in long-term limbo having not played or trained since their 2016 ACN win. But rather than not cope Oshoala has thrived. With 12 goals she was the Chinese Super League’s topscorer, helping Quanjian to league and cup titles before being named the league’s best player. “At the end of the day it has been a great move for me. I had to put in a lot of work. I worked harder because I had to prove people wrong,” she says. And while the overall level may be considered lower, it is a more level playing field across the league. “When you go to England or France you see teams taking 7-0, 8-0 beatings but you don’t get that in China,” she says. “It’s much more even. Every team has players in the national team and players from abroad. That’s what you need. Being reliant on hand-outs from the men’s side is not the answer for Oshoala, though. “We don’t want to be sharing with the men’s team any more and waiting for the funds to be able to do things,” she said.